This morning’s (8.30 a.m.) installation of bollards in the laneway (between Shepparson Street and Koornang Road, Carnegie) ends over two years of frustrating argey bargey between residents and Council re a significant pedestrian and child safety issue. In line with residents initial request, permanent bollards and appropriate signage have now been installed. Gone are Council’s unacceptable and unsuccessful earlier solutions of time restricted vehicle laneway signage and the recent installation of speed humps. While residents are happy that a significant longstanding issue has finally been resolved without any personal injury occurring, they are also seriously questioning Council’s processes which did not result in the timely application of a simple cost effective solution to a high risk situation. A high risk situation that at all times was undeniably within Council’s traffic and pedestrian safety responsibilities. More about these processes in a subsequent post – for now, residents are extremely relieved that “finally sense prevails”. 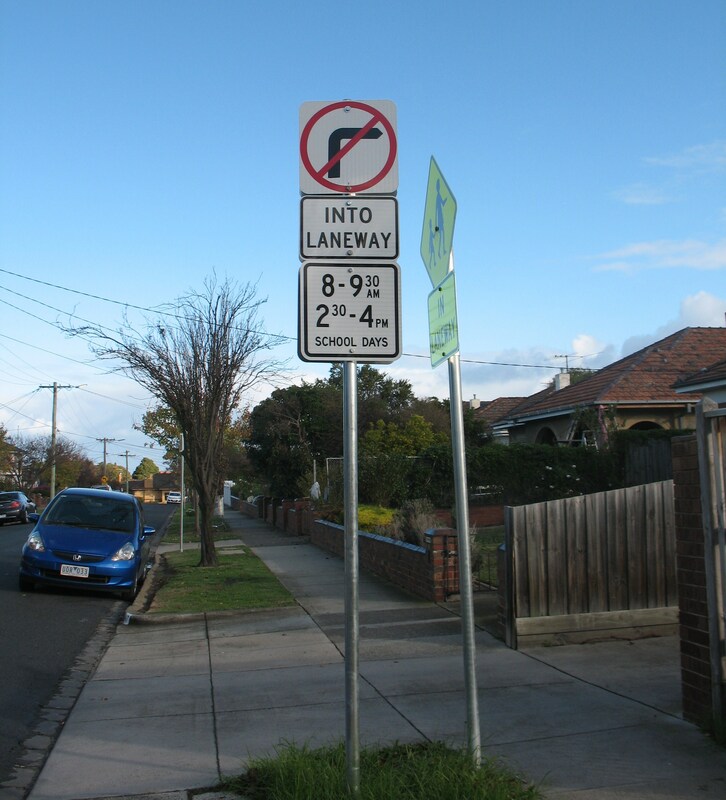 The second sign, banning vehicle usage of the laneway during peak school usage times, was installed at the Koornang Road laneway entrance on 30/5/2016. Last Friday 27/5/2016, one month after Council decided to “ban” through vehicle usage of the Koornang/Shepparson laneway during peak school access times via signage, residents were notified that the signage would be installed that day. After 12 months of wrangling with Council, the residents were delighted to see the signage being installed – the signage is highly visible and readily understood. Alas, the “spanner in the works” became readily apparent when only one sign was installed. And that installation was at the Shepparson Avenue laneway entrance rather than the Koornang Road laneway entrance. The Koornang Road entrance being the entrance most used by motorists seeking to avoid the Koornang Road traffic congestion. As Council has been unable to advise why only one sign was installed, residents are admiring Shepparson Avenue signage and wondering if they should do a quick whip around to fund the Koornang Road signage. After 11 months of frustrating argy-bargy between residents and Council, at last night’s (26/4) meeting, Councillors decided to end the impasse on the significant cyclist and pedestrian (particularly child) safety issues that exist in the Koornang/Shepparson laneway section in Carnegie. Councillors decided to restrict through vehicle laneway usage during peak school access times (a.m. and p.m.) via signage (cost = $200.00). If motorists continue using the laneway as a “short cut/rat run” after the signage has been installed or, as per Cr. Magee, if a “catastrophe occurs”, residents were assured that Council will consider installing a removable vehicle barrier in the laneway section during peak school access periods. While residents welcome the end of the impasse, many are left wondering why it took so long for Council to “do something” that addresses a clear-cut safety issue and are fully expecting to return to the fray sometime within the next twelve months. They believe that signage alone is unlikely to be an effective, long-term deterrent for those motorists who think it acceptable to use the laneway as short cut/rat run during peak school access times. 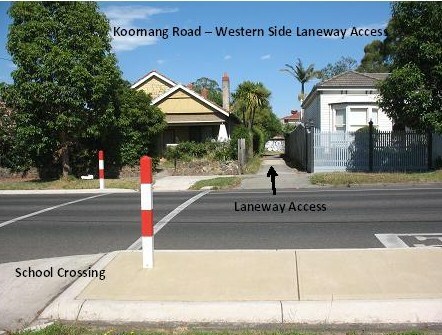 In May, 2015, concerned residents first contacted Council re the inherent risks associated with combined through vehicle and cyclist/pedestrian (particularly parents and young children) usage in a section of the Koornang Road to Tranmere Avenue, Carnegie, laneway – the laneway, which connects to the Koornang Road School Crossing, provides a significant pedestrian short cut to the Carnegie Primary School. The section of the laneway deemed unsafe by residents is the Koornang Road to Shepparson Avenue section which is being used as a “rat run” (a.k.a. shortcut) to avoid Koornang Road traffic congestion. Over the ensuing 11 months, there have been frequent communications between residents, Council Officers and Councillors – yet despite this communication, Councillor and Officer site visits and publicity in the local media, residents report Council has maintained a “do nothing” (Leader article 12/01/2016) approach that favoured vehicle over cyclist/pedestrian laneway usage. Therefore, when in response to a reported incidence, Councillors formally requested an Officer’s Report ( 2016 03 15 Extract from Minutes of Council Meeting), outlining the possible measures that could be taken to close the laneway to through vehicular traffic during peak school access times, residents welcomed that initiative. It was seen as a positive step towards ending the current impasse that would provide an objective assessment of the current issues, their potential solutions and lead to a safer environment for families accessing Carnegie Primary via the laneway. Unfortunately, Friday’s published Officer’s Report, presented by the Manager, Strategic Transport, does not provide an objective assessment of either the current issue or potential solutions and the proposed recommendations do little to ensure a safer environment within the laneway. 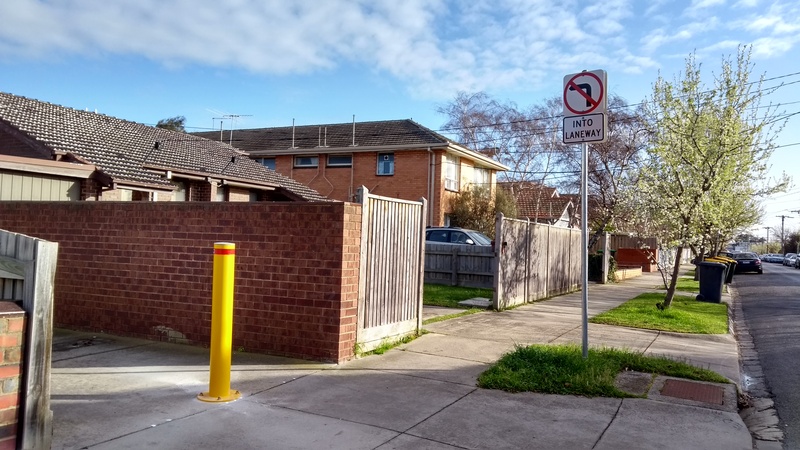 Particularly as the residents simple yet effective, proposed solution of installing a bollard and appropriate signage in the Koornang/Shepparson laneway (estimated total cost $400)* section has been overlooked. * Although both the cost of bollard and speed hump installation was sought in a public question (15/3/2016 Public Question Extract) surprisingly Council was unable to provide that information. The estimated cost is therefore reasonably assumed to be equivalent to the recently advised cost of manufacturing and installing 6 time restricted parking signs in Elsternwick ($200) plus Council’s advised signage cost of $200. The multi coloured dotted line denotes the laneway access to Carnegie Primary School from Tranmere Avenue. 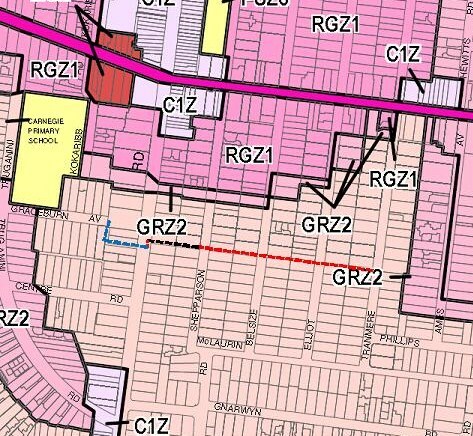 The Red dotted line denotes the Shepparson to Tranmere section of the laneway that is not currently deemed unsafe by residents, however, given the pace of development along Neerim Road it may become unsafe in the future. The Black dotted line denotes the Shepparson Avenue/Koornang Road, Carnegie, section of the laneway which residents argue is currently unsafe. 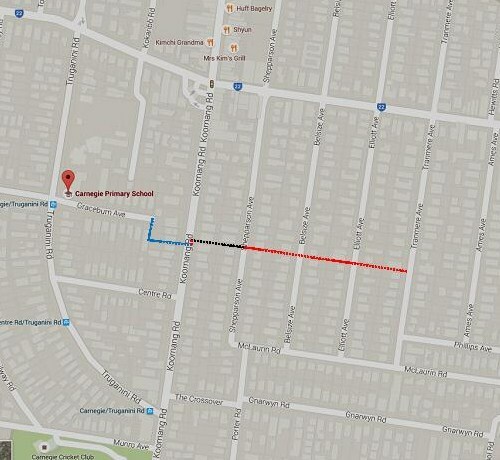 The Blue dotted line denotes a closely aligned laneway that connects Koornang Road with Graceburn Avenue and the Carnegie Primary School. Is 80-85 metres long and 3 metres wide and surrounded by solid high fencing – given current vehicle widths, cyclists and pedestrians (particularly those with strollers and/or young children yet to develop risk awareness) are provided with little scope for action. The laneway’s significance in providing pedestrian access to Carnegie Primary, has been recognized by Council’s placement of a supervised school crossing in Koornang Road. The school crossing connects this laneway with the Koornang/Graceburn laneway. The 4 properties abutting the laneway section do not use the laneway for vehicular access to their properties – all use on-street cross overs (driveways). Residents have advised that property owners have given verbal approval for the laneway to be closed to through vehicle traffic. All vehicular usage of the laneway is through traffic seeking a short-cut to avoid traffic congestion at the traffic lighted Koornang/Neerim or Koornang/Truganni intersections. Allows for through vehicle traffic, where as the Elliot/Tranmere section of the laneway is permanently blocked to through traffic by an aged, permanently installed bollard. As per the Glen Eira Road Register (December, 2015), Council is responsible for traffic management within the roads/streets that connect with the laneway and in the laneway itself. GERA and residents accept that through vehicle usage of the Koornang/Shepparson laneway section during peak school times is relatively low (ie. an average of 3 vehicles, where residents consider 1 too many) and usually at low speeds consistent with the laneway’s narrow width. However, Council’s expectations that motorists, who knowingly use the laneway during at peak school times as a time saving “short cut”, will use caution and stop to allow cyclists and pedestrians to pass safely are not being met. Rather than slowing or stopping, vehicles continue moving forward while blowing their horns. Cyclists and pedestrians are then required to “squeeze up next to the wall when cars come past because even they only just fit through” in a confined space that does not provide either party with space to respond to the consequences of “a moments inattention”. allowing continued through vehicles (presumed to be driven by local residents) laneway usage, in order to avoid traffic congestion at either the traffic lighted Koornang/Neerim or Koornang/Turganni intersections, creates an inherently high risk situation that is difficult to reconcile with accepted good traffic management concepts. Closing the laneway to through vehicle traffic will have minimal impact on motorists both in terms of time/distance and traffic volumes. Not closing the laneway to through vehicle traffic will have a major impact in terms of time/distance (approx. 500m – as it will involve accessing the School either by Neerim Road (North) or by the Crossover (South) then “doubling back”). This extra time/distance, combined with the safety issue may well result in increased traffic congestion as parents opt to drive rather walk their children to school. In the absence of definitive timeline (eg. July, 2016 vs. June, 2017), allows a high risk situation, that has existed beyond its use by date to remain unaddressed for an indefinite period. The cost of installing the proposed speed humps is not known as Council, surprisingly was unable to provide the information (15/3/2016 Public Question Extract). Council’s inclusion of the Koornang/Graceburn laneway (via the Councillor’s unanimous resolution for a Report on the Koornang/Shepparson laneway) is questionable since, during the past 11 months, neither the residents nor GERA have implied, or raised, any safety issue regarding the Koornang/Graceburn laneway. Both GERA and residents, agree with Council, that Koornang/Graceburn laneway’s sharp right angle corner and partially paved surface makes it “not trafficable” to modern through vehicular traffic. Additionally, it lacks the smooth concreted surface (installed by Council approx. 3 years ago) and straight, clear line of sight that exists in the Koornang/Shepparson section of the Koornang/Tranmere laneway. A more appropriate comparison would be with the Elliot/Tranmere section, since both are of the same dimensions (length and width), are a confined by high solid fencing and provide a straight, clear line of sight. A permanently installed aged bollard, which prevents through traffic in the Elliot/Tranmere section, being a major difference. that the “restriction of access to the laneways, by way of erecting a barrier, such as a gate or bollard(s) …. Would be a permanent arrangement that applies at all times. The process does not enable the bollards to put in place only at specific times”. 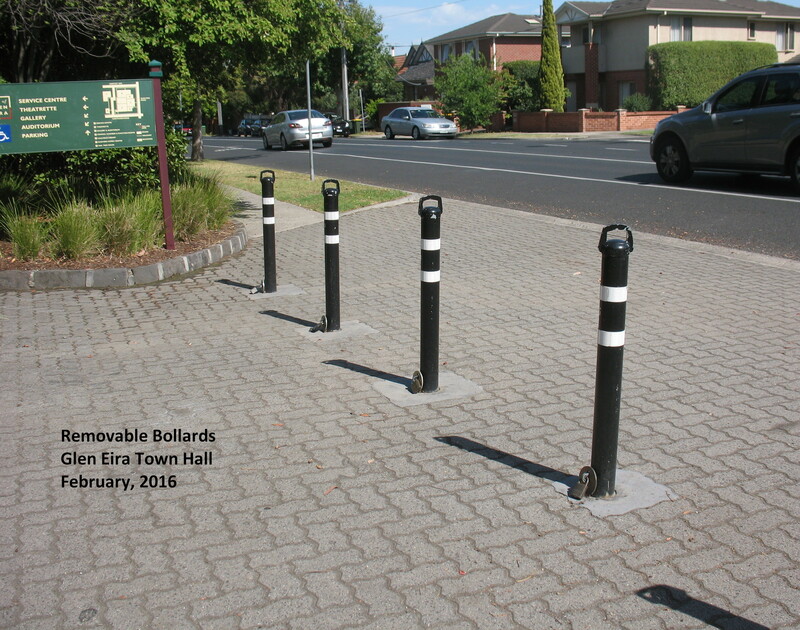 Bollards may be permanent or temporary and it is conceivable that bollard placement and removal could be included in the duties of the Council’s School Crossing Supervisor. GERA believes that designating the Koornang/Shepparson laneway section as one-way traffic only (direction yet to be specified) in an attempt to reduce vehicle volumes will yield an uncertain outcome. Signage by itself does not restrict vehicle access. While we acknowledge that one-way designations are a known traffic management treatments for “rat runs”, to be effective in managing traffic flows they require an opposite direction one-way designation in close proximity. Since this is not available, GERA supports the recommendation not to implement this option. It’s advantage is that at all times cyclists and pedestrians have legally enforceable rights of way over vehicles and vehicle speed limits are usually restricted to 10 kph. Council’s preferred option is to restrict turns accessing and exiting the laneway, at various times during the day, via signage. However, as mentioned previously this does not restrict vehicle access and unless monitored by a traffic infringement officer is unlikely to provide a long term solution. There is a definite probability that motorists, who consider it acceptable to use the laneway for through access while it is occupied by cyclists/pedestrians, will continue to use the laneway regardless of the signage. Therefore, GERA and residents do not support it’s implementation. In summary, GERA urges Councillors making a decision on the most appropriate and effective option for eliminating the risks within the Koornang/Shepparson laneway section to take a step back and undertake an objective assessment of the issue. Quite frankly, both the situation and the most appropriate solution are so simple that many are scratching their heads wondering why after 11 months the issue has yet to be addressed. The situation is that a small number of vehicles (ie. 3) consider it acceptable to use the laneway as a time saving short cut during peak school access times and by doing so create a an unacceptable level of risk for cyclists and pedestrians. Combine this usage with motorists sporadically failing to exercise the level of caution expected by Council and that level of risk escalates to beyond unacceptable. The solution is to prevent through vehicle usage during peak school access times by installing a vehicle blocking barrier (eg. gate or bollard) and no through road signage during specified time periods. Bollard (at an estimated cost of $400) will be as effective as a gate and less costly vs. a gate which requires a support posts (bollards?) and design features that will not impede cyclists, pedestrians with strollers or those with mobility disabilities. 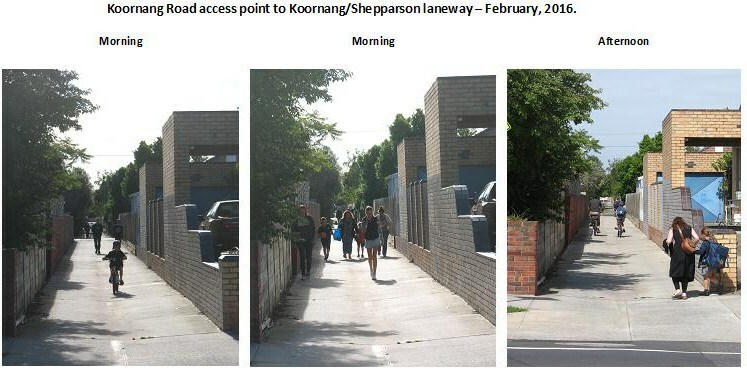 While the current discussion has focused on peak school usage, the Koornang/Shepparson laneway section is also used on a daily basis, during off peak school access hours, by not only through vehicle traffic but also by cyclists/pedestrians/disabled accessing the Koornang Road bus service, the local convenience stores/services near Truganni Road and the Route 67 tram service. This cyclist/ pedestrian/disabled usage should be considered when determining temporarily or permanently closing the laneway to through vehicle traffic. Readers may remember a Leader article (12/01/2016) entitled “Lane Impasse” that related to calls from residents to restrict through vehicle traffic in a section of a Carnegie laneway that is used by pedestrians to access the Carnegie Primary School. The resident’s concerns relate to significant safety issues that arise when vehicles (seeking to reduce commute time, a.k.a. “rat running”) and pedestrians (particularly parents and young children walking to/from the Carnegie Primary School) are combined in a confined space (3m x 75-80m) defined by high fencing. Residents advise that Council is still not “budging” from it’s June, 2015 decision to install signage and discourage pedestrian use of laneway as Council cannot restrict access to the laneway. This is despite the residents continuing to report issues of vehicles not exercising caution when using the laneway (the latest report being made early last week). GERA is supporting the residents over this significant safety issue and provides the following analysis of the issues (together with proposed solutions) to assist them in their future dealings with Council. 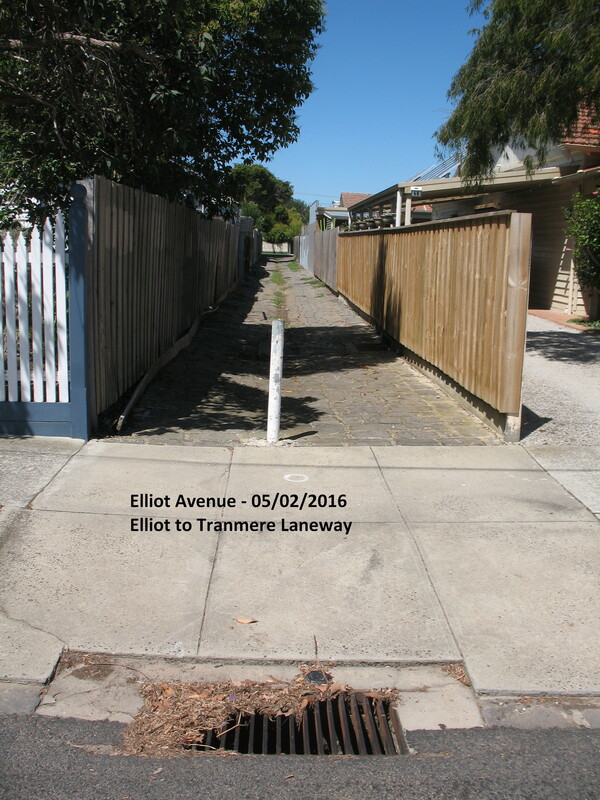 There is an apparent contradiction in the statement (above attached Leader article) that “council’s transport planning manager was unable to restrict access to the laneway because properties next to it could, in future, create an access point” in that Elliot Avenue’s access to the Elliot/Tranmere section of the laneway has an aged, permanent bollard installed that prevents through vehicle usage. 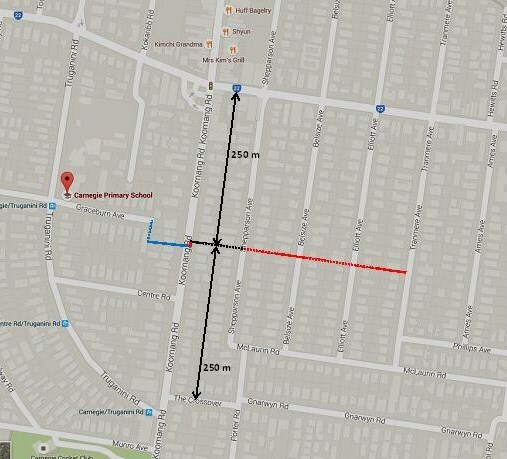 If the laneway is unable to be safely used by pedestrians to access the Carnegie Primary School (and the Route 67 Tram Service), this will add a significant extra distance for pedestrian school access as it will involve accessing the School either by Neerim Road (North) or by the Crossover (South) then “doubling back”. This extra distance (approximately 500m), particularly when combined with the current and expected future disruption caused by construction in and around Neerim Road, is contrary to Council’s Sustainable Transport Policy and may well result in increased traffic congestion as parents opt to drive rather walk children to school. In contrast, the increase in travel time incurred by confining vehicles to the road network proper is minimal. 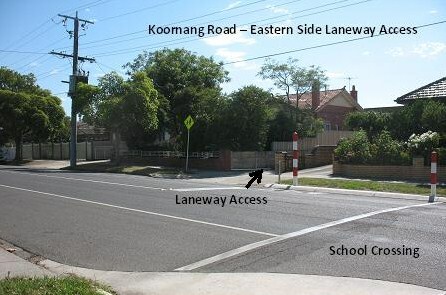 The significance of pedestrian usage of Koornang/Tranmere laneway to access Carnegie Primary School has been recognised by Council, via locating a school crossing that links the laneway’s access point on the eastern side of Koornang Road with a closely aligned laneway (located on the western side of Koornang Road) which connects Koornang Road with Graceburn Avenue. The Carnegie Primary School being located on the corner of Truganni Road and Graceburn Avenue. it is reasonable to conclude that providing pedestrian access to the Carnegie Primary School was a significant (if not primary) factor in the creation of the Koornang/Tranmere laneway. The possibility of relocating the lighted speed limit signage facing traffic travelling north on Koornang Road to a location that is before (rather than after) the school crossing. Undertaking an analysis of the current and future laneway usage by both pedestrian and vehicles. While the Koornang/Tranmere laneway is located in a Neighbourhood Residential Zone (which restricts redevelopment to 2 stories and 2 dwellings per lot), the laneway’s proximity to the Carnegie Growth Zones (3-4 story multi unit development zones) points to a likely significant future increase in pedestrian laneway usage (to access Carnegie Primary School) not only in the Koornang/Shepparson section but also in the Shepparson/Tranmere sections. Similarly, through vehicle usage of the laneway is also likely to increase. Therefore, in line with good planning concepts, GERA urges Council to consider applying the results of the Council’s review of the Koornang/Shepparson section of the laneway to all sections of the laneway. o “no throughway” signage at appropriate locations, eg. at laneway access points, on each bollard. o have little impact on a possible future requests from abutting properties for property access points to be provided via the laneway. * In August, 2012, in response to a Public Question, Council advised “that the cost of six parking restriction signs manufactured and installed by Council’s depot was less than $200” (ie. less than $33.33 each). Designating the laneway as a Shared Zone and installing appropriate signage (not GERA’s preferred option). o a low vehicle speed limit (typically 10 km/h) is applicable within the laneway. However, such a designation may take time to implement and become widely known/accepted and encourages through laneway vehicle usage. Council’s public statements on community consultation, traffic management, open space and transparent and accountable governance are encouraging but unfortunately more often than not Council’s actions do not match its words. “The period covered by Council’s 2007/8 – 2011/2 Road Safety Strategy is at an end. A new Strategy is being developed. Community consultation is a key stage in the process. This will occur in early 2013. When the new Strategy is adopted by Council, it will be placed on Council’s website. Copies of the current strategy are available upon request. “Council provides a range of traffic management initiatives for the benefit of its residents and ratepayers. Addressing safety is the most important task. The basis for achieving this is Council’s Road Safety Strategy (RSS). The RSS prioritises needed changes to the road system that will address identified safety concerns. Accident history informs the RSS priorities. The RSS is a “living” strategy and priorities change with updated data”. The 2007/8 – 2011/12 Glen Eira Road Safety Strategy , was prepared by Andrew O’Brien & Associates Pty Ltd+ in December 2006 and is based on 2005 data. Prior to 2008, Glen Eira Council (in line with other metro Melbourne Councils) updated the Road Safety Strategy annually (statistics) and rolled the horizon forward for 4 years. However, unlike other metro Melbourne Councils who continue to update their strategies annually, Glen Eira has not updated their strategy for 6 years. The principal focus of a Road Safety Strategy is to reduce road trauma (a.k.a. personal injury crashes/collisions, in terms of numbers and severity). With the increasing number of vehicles on roads, comes increased residential, commuter and visitor traffic. The need for a fluid and adaptable strategy that meets the changing needs of the road safety issues (particularly rat runs in residential streets) is readily apparent. With the push to sustainable public transport and active transport (pedestrians and cyclists) the need to ensure the safety of these most vulnerable road users (as opposed to a single occupant vehicle) is also readily apparent. Glen Eira Council’s response to residents’ concerns on traffic and road safety concerns (both during the community plan consultation and over many years) is to describe an obsolete Road Safety Strategy as “living”, and to stress how important community consultation is in developing the strategy. The action of doing nothing until 2013 (when, at a minimum, updating the Road Safety Strategy should have commenced in 2011), is poles apart from the words. It is something voters should take into consideration in this Saturday’s (27/102012) Council Elections. * The 2012 Community Plan (linked above) has been heavily criticised as being representative of Council’s (predominantly the Administration’s view, with little opposition by elected representatives) rather than the residents’ views. So much so that unprecedented in Glen Eira’s history, a Council appointed community representative on the Community Plan, Valerie Johnstone, lodged a formal submission to (Council Meeting Minutes, 12th June, 2012 – Section 9.6) suggesting improvements that were not included in the plan yet were clearly expressed at the various committee meetings. Additionally as a result of her experiences on the Community Plan Committee, another of the community representatives (Kate Dempsey – Camden Ward) has decided to stand for Council. + Over a period of time Glen Eira Council has subcontracted all traffic engineering activities/services to O’Briens Traffic. Disclaimer: At the time of posting Council’s website is down, therefore, links provided to documents (Council Meeting Minutes and the Community/Council Plan) are generating a “System.OutOfMemoryException” message. GERA will monitor and re-establish the links when Council has corrected it’s website. Authorised by M. Healy, 100 Eskdale Road, Caulfield North. Following on from GERA’s recent (12/7/2012) Residents’ Traffic and Parking Forum and the numerous criticisms attendees made of this Council’s lack of responsiveness when it comes to residents raising issues of safety and parking in local streets, one of our members has drawn our attention to the Kooyong & Alma Roads Intersection reconfiguration for a bicycle safety trial. Since the trial is to provide data to determine if the intersection reconfiguration should be rolled out to other intersections in the Municipality, many other intersections could experience a similar impact. The Kooyong and Alma Road intersection is a residential intersection. In November, 2011, Council advised residents of the intersection that the intersection lanes would be would be reconfigured to trial a design aimed at improving safety for bicyclists – the trial would last 6 months. There was no consultation with residents on the reconfiguration – the reconfiguration work was completed on 22nd December, 2011.
removed 13 on street car parking spaces in an area where on street parking is in high demand. In the discussion, that arose from this Request, Councillors argued against suspending the trial to allow for consultation with residents and inclusion of residents proposed solutions in the trial intersection design. Councillors voted to continue the trial. Residents, while awaiting the Report, continued to voice concerns to both the Administration and Councillors. Four months into the trial, the requested Report was presented at the 10th April, 2012, Council Meeting (Council Minutes, 10/4/2012 – Section 9.2) where again the decision was made to continue the trial regardless of residents’ negative feedback. Under Council’s “Road Safety Strategy 2007/08 – 2011/12” the intersection of Kooyong Road / Alma Road has been identified as the equal worst intersection in terms of casualty crashes (under the care and management of Council). The 6 month trial is due to conclude on 22 June 2012. Traffic flow along Kooyong Road and Alma Road has been adversely affected. In the last 5 years of available data (1 January 2006 – 31 December 2010) six (6) casualty crashes have been reported at the intersection. … None of the crashes involved cyclists. Residents were encouraged to provide feedback during the trial. what opportunity the community would have for input into Council’s decision to implement/not to implement the intersection configuration throughout the Municipality. “A Joint Letter signed by 243 persons and reading: “We oppose the removal of 13 car spaces in close proximity of the Kooyong Road/Alma Road intersection as well as the alteration to the intersection” was received. The motion put and carried unanimously was that the Joint Letter (although the document submitted to Council is titled a “Petition”) be “received and noted.” Which can be taken to mean it is noted in the minutes, the standard letter will be sent, then Council will file the petition/joint letter. The level of frustration experienced by the 243 (which in local government terms is a significant number) signatories is palpable. The Kooyong and Alma Road Intersection Reconfiguration Petition outlines the reasons for the residents criticism of the reconfigured intersection (refer above) and adds that communication since the trial commenced has been “weak”. In the discussion that followed the presentation of the petition, in response to a Councillor question re when the trial commenced, the Administration (Director City Development – Jeff Akehurst) responded that he did not know. Given that the petition was presented, in accordance with the rules ie 2 working days prior to the meeting, it is disconcerting to note that no Councillor or Senior Officer gave any consideration to the matter (i.e. looked at the file, asked a question, or remembered the previous meeting’s discussion) prior to this meeting. The trial is now over (22/06/2012) and the residents are awaiting the results of the trial. Details of data evaluation, recommendations and community consultation remain unknown. GERA is concerned that the Council (Administration and Councillors) have not been responsive to residents. At no stage during this process, did Council provide an opportunity for Councillors, Residents and Traffic Management to openly discuss the issues raised and reach consensus. Once again there is a significant gap between Council’s claims and actions. The Council claim that “We work to develop a tolerant and caring community, where everyone can feel they belong and participate in the decision-making that leads to achieving the best possible options … We consult, listen, and take note of community views to determine its priorities and needs and then act through open, transparent processes …” (refer council’s website ) is not readily apparent in the above instance. Questions related to the evaluation (what criteria are used to evaluate the trial outcome), when the community will be advised of the results of the evaluation and when the community will be given the opportunity to participate in the decision are yet to be answered. as Council claims in the 2012 Community/Council Plan – Theme 2 – Traffic, parking and transport) “The RSS is a ‘living’ strategy and prioritizes change with updated data” why hasn’t this document been updated regularly. With less than 6 months to go before the document becomes obsolete, when is the new RSS to be presented for community consultation. Council places, as it repeatedly states, a “ high priority on ensuring that the community is provided with a safe and efficient road network …” (Council’s website), why haven’t the safety issues in an intersection which was identified 7 years ago as the “the equal worst intersection” been previously addressed. + Council is currently updating it’s website and the new link to the Road Safety Strategy (RSS) document has yet to be added to the website. This document was previously downloaded from Council’s website to GERA’s files and is therefore linked to this posting. GERA will link to the RSS on Council’s website when it becomes available. GERA thanks the 50+ residents for attending last Wednesday’s (11/7/2012) GERA Traffic and Parking Forum – your attendance and discussion contributions made for a very successful and informative evening. The three speakers (Dr. Bruce Corben, Cr. Narelle Sharpe, Cr. Serge Thomann) spoke about traffic management, road safety and parking innovations from research perspective and the various approaches Councils use to address these issues. Unfortunately, no Glen Eira Councillor attended the forum. Dr. Bruce Corben focused on the issue of safety and the need for road design and traffic calming treatments to reduce speed. Dr. Corben outlined a “shift in thinking” in the design of roads and traffic management treatments which recognizes that drivers of vehicles cannot be 100% perfect/functional 100% of the time. Therefore, the concepts of Vision Zero (no deaths) and reducing speed (to protect the most vulnerable road users – pedestrians, cyclists) are now becoming inherent in traffic engineering/management. Good road design and good traffic calming treatments – which aim at reducing speed and the reliance on vehicles – not only have the well-known tangible benefits of improved safety (less accidents and reduced severity of accidents), a more active population, energy conservation and reduced emissions but also have the lesser known intangible benefits of fostering a sense of community and social contact in a less stressful environment. Dr. Corben also commented that arguments against installing traffic calming treatments based on the cost of such treatments are increasingly being considered unjustifiable – the dollars and a few seconds added to a motorist’s trip are simply not worth compromising the safety of all. Cr. Narelle Sharpe, Moonee Valley Council, outlined the approach that MVCC has taken to the traffic and parking issues within their municipality. Similar to Glen Eira, Moonee Valley has diverse areas with different traffic and parking issues (the race course, older areas with narrow streets, newer areas with wider streets, shopping and entertainment precincts etc.). MVCC has recently completed an extensive evaluation, which included substantial community consultation, of the municipality and significantly revised their Local Area Traffic Management (LATM) scheme – 22 LATM’s have been recognized and scheduled for review. The MVCC is investing $40K-$45K for each LATM scheme. Each review will ensure parking and traffic conditions meet the local needs, provide improved accessibility for other parking users and address the wider metropolitan requirements such as enabling through traffic. Cr. Sharpe reported that the LATM approach allows Council to change from being reactive to being pro-active when addressing traffic and parking issues and enabled a holistic approach to be taken. As Cr. Sharpe stated a change in one street, flows on to other streets – “ it is no good fixing an issue in one street by shifting it to the next street”. Kerbside Road Space User Hierarchy – is a system that prioritises the needs of the various users depending on the type of area considered (for example residents have priority to park in residential streets, in activity centres customers/patrons have priority). Parking Demand Management Framework – establishes a clear 85% rule for managing parking within the Moonee Valley municipality and 4 tiers of restricted parking (the higher the tier, the greater the restriction) are applied. If 85% of available parking space is continuously occupied then parking restrictions are introduced to encourage a regular turnover of vehicles. The tier of the parking restriction (eg 1P, 2P) is dependent on the needs of area or the activity centre generating the demand for parking. Community (residents, retailers, commercial operators) consultation is always undertaken prior to restricted parking being implemented. considering the impact of traffic/parking on a local area basis and the flow on impact that installing a traffic calming treatment, or restricted parking, in one street will have on other streets in the local area. extensive community consultation (to identify issues, develop solutions and achieve community support) leading to the development of a traffic management plan for the local areas. Glen Eira has LATM’s and has used this holistic management approach in the past, however, recent decisions (lower speed limits in Glen Huntly Road and Centre Road, speedhumps in McKinnon Road) and Council’s failure to proactively recognise the “rat runs” this has caused in nearby residential streets indicates it no longer follows this approach. A Road User Hierarchy – which focusses on the needs of the most vulnerable road users – pedestrians’ needs are our foremost priority, followed by bicycles, public transport users and finally trucks and single occupant vehicles. Port Phillip actively discourages through traffic use of residential streets (rat runs) and encourages use of main roads by installing a wide variety of traffic calming measures in local streets (including blocking off residential streets). In determining if, and what type of, traffic calming treatment is to be installed, the flow on impact to other local streets is also considered and addressed. Where possible Port Phillip incorporates, and maintains, street planting in traffic calming treatments. Port Phillip sees itself as being responsible to provide parking for its residents, retailers, workers and the patrons of its areas – it does not see itself as responsible to provide parking for commuters, therefore, most of Port Phillip has restricted parking. Since 2002, Port Phillip has excluded any development which intensifies the number of residences on a lot from its residential parking permit scheme. Open Discussion – after the presentations a general discussion occurred in which the residents made the following comments on Glen Eira’s traffic and parking management issues. Council is unresponsive to residents’ concerns – the expense of installing traffic calming treatments in local streets is the standard reason for refusal. Issues of safety do not seem to be given any weight or adequate investigation. Council does not adopt a holistic approach – the decisions it has taken on traffic management in Glen Huntly Road, Centre Road and McKinnon Road have resulted in ‘rat runs’ (usually at high speed) in nearby streets. That “professionals” didn’t recognize this flow on impact, or take it into consideration, is source of frustration to residents. No community consultation occurred prior to or after the installation – residents feedback since installation is not heeded. Council’s enforcement of the residential parking permit system or parking restrictions in various activity centres (eg Carnegie and Murrumbeena) is minimal. It relies on motorists doing the right thing or residents raising an issue with a particular vehicle. Patrolling these areas need not be daily but even a once weekly patrol would make a significant difference in the no. of vehicles overstaying their welcome. Glen Eira has community buses, however, they do not provide any bus service within the municipality. The community buses are provided and maintained by Council for use by non-profit organisations or groups in the municipality. At the end of the open discussion, Cr. Thomann commented that this was an election year and although Councillors may not have been listening for the past 3.5 years they should be listening now. Residents needed to stand up and make sure that Councillors and the Administration listened. GERA thanks Dr. Bruce Corben, Cr. Narelle Sharpe and Cr. Serge Thomann for their presentation and active participation. GERA will actively lobby Councillors to listen and focus on the items raised during the forum. GERA welcomes resident involvement in these endeavours. The results of the State Government’s Customer Satisfaction Survey and strong feedback from residents shows that traffic and parking management are major issues facing Glen Eira and that increasingly residents are dissatisfied with Glen Eira Council’s performance on these issues. Strategic trafﬁc management planning — ongoing strategic research and development of community responsive strategies with respect to the broad range of transportation and urban infrastructure issues relevant to Glen Eira. Internal trafﬁc management advice — ongoing trafﬁc management surveys, analysis and advice. Local area trafﬁc management — preparation and design of trafﬁc management schemes and management of associated public participation processes. Admirable aspirations which, however, are not supported by the reference documentation. At the time of this posting, the referenced document is the Glen Eira Road Safety Strategy 2007/2008 -2011/2012 written in December, 2006, by Council’s consultant. One wonders where the Strategy of 2011/12 – 2015/16 (and intervening years) is and what public participation was involved in it’s development. The focus of the 2007/8- 2011/12 Strategy is clearly stated – “The primary objective of any road safety strategy should be to reduce road trauma. Convenience, amenity and property values are secondary considerations.” Traffic management decisions rely heavily on the VicRoads CrashStats Database, which at any given time, is approximately 6-12 months out of date. With the growth of population, both within and outside the Glen Eira boundaries, comes increased residential, commuter and visitor traffic. Increasingly “rat runs” (usually above the speed limit) are made through residential streets to avoid congested areas. Council’s focus on arterial roads without considering the flow on impact on local/residential streets is not good traffic management and does little to address this growing “accident waiting to happen” concern. Requests for installation of traffic calming treatments (which reduce speeds and through traffic) in residential streets are being met with comments of “Council’s budget only allows 4 – 5 such treatments a year … and your request has been prioritised as 295”*. GERA accepts that a priority system is required as Council does not have the resources to satisfy every resident request. However, GERA argues that, given the increasing number of traffic issues experienced in local residential streets, Council needs to increase it’s budget to provide for more traffic calming treatments in local streets and needs to conduct proper community consultation when budgeting the appropriate number of treatments to be completed annually. *Quoted from letters sent to an Eskdale Road (between Bambra and Kambrook Roads) resident. Council’s 25th May, 2011, traffic count shows that, within 100 metres of crossing the speed humps located in this section of Eskdale Road, 246 vehicles per day exceed the 50 km/h speed limit. The speed humps and road service are gouged.